This pairing of a J.Crew collection olivia topcoat with grosgrain ribbon from J.Crew and a white shirtdress is so easy to do and so comfortable to wear all day long as well! When it comes to footwear, this outfit is complemented well with black suede over the knee boots. 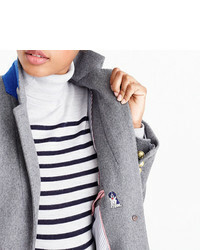 If you're scouting for a casual yet stylish outfit, consider wearing a J.Crew collection olivia topcoat with grosgrain ribbon and a grey mini skirt. Both garments are totally comfy and will look fabulous together. Perk up your look with beige leather heeled sandals. If you're on a mission for a casual yet totally chic ensemble, dress in a J.Crew collection olivia topcoat with grosgrain ribbon and black ripped skinny jeans. Both pieces are totally comfy and will look fabulous together. Grey athletic shoes will add a sportier vibe to your ensemble. For a casually elegant look, try teaming a J.Crew collection olivia topcoat with grosgrain ribbon with a white lace sheath dress — these two pieces work nicely together. When it comes to shoes, this outfit is round off wonderfully with beige leather heeled sandals. For a casually elegant getup, reach for a grey coat and a white button down blouse — these items go pretty good together. When it comes to shoes, this look is finished off nicely with black suede ankle boots. For a casually elegant ensemble, team a J.Crew collection olivia topcoat with grosgrain ribbon with black tapered pants — these two pieces go perfectly well together. When it comes to shoes, this outfit is round off wonderfully with black leather ankle boots. 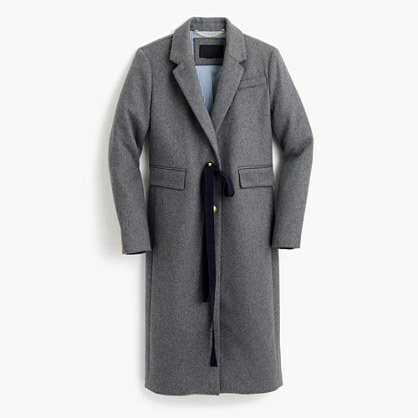 If you don't like being too serious with your ensembles, choose a J.Crew collection olivia topcoat with grosgrain ribbon from J.Crew and black skinny jeans. When it comes to footwear, this getup is round off nicely with black leather pumps. 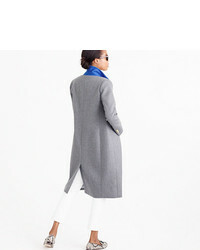 If you're on the hunt for a casual yet totally chic getup, opt for a J.Crew collection olivia topcoat with grosgrain ribbon from J.Crew and white ripped skinny jeans. Both items are totally comfy and will look fabulous together. Up the cool of your getup by rounding it off with black leather pumps. If you're on a mission for a casual yet totally stylish getup, go for a J.Crew collection olivia topcoat with grosgrain ribbon from J.Crew and charcoal skinny jeans. Both garments are totally comfy and will look fabulous together. When it comes to shoes, this getup is complemented wonderfully with brown leather ankle boots.